Accessing our innovative products just became even easier! 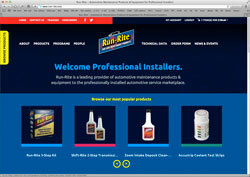 At Run-Rite, we have expanded our commitment to customer service excellence with the launch of our brand new e-commerce website. Packed with information to help your business succeed, the new site is open for business 24/7 so you can explore and order our products when it's most convenient for you! When you have a question about a product, the information will be available at your fingertips, any time, day or night. With technical data, informational and training videos, and product information you can share with your customers, our new site is destined to become one of your favorite spots! Run-Rite is heading to AAPEX! Come visit us at Booth 4676 - November 4th - 6th at the Sands Expo in Vegas! Our team will be attending AAPEX 2014 at Sands Expo in Las Vegas, Nevada. We hope to see you there! Check out the details!